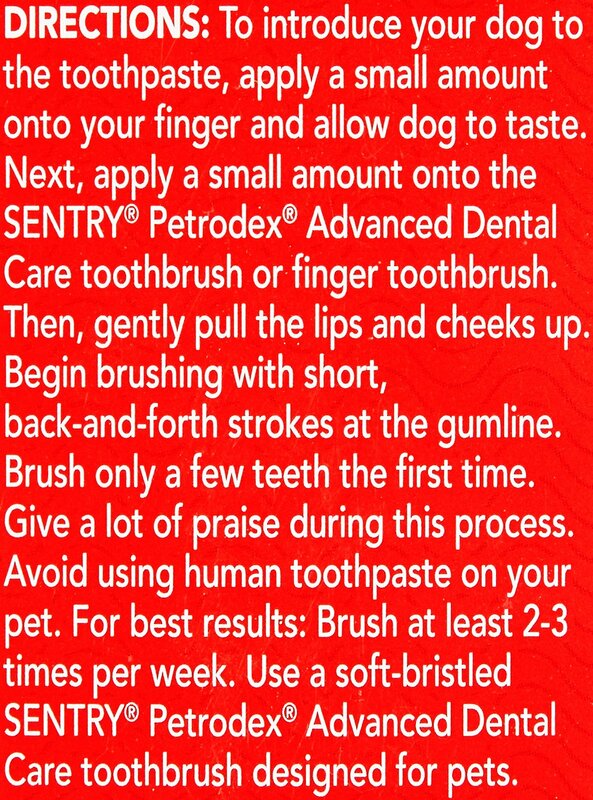 Sentry Petrodex Veterinary Strength Peanut Flavor Dog Toothpaste is formulated specifically for pets. Helps control plaque and tartar, and fights bad breath. Your pup will love the peanut taste and you'll love their fresh breath! The color is a startling green so I thought I bought the wrong flavor, but it was clearly labeled peanut butter flavored. My Golden loves peanut butter but this is not one she enjoys as much, making brushing a bit more challenging. 5 stars approved by my dogs and I! Absolutely love it! It keeps my dog’s breath smelling good and is also affordable and best of all they eat it right up like it’s a treat! Peanut butter flavor is the one I got my dog’s. First time thinking of brushing my dogs teeth worried she wouldn’t like it at all, however my dog enjoys this flavor and doesn’t mind me brushing her teeth at all with this. Will buy again. This is a very affordable product that my dog seem to love the taste. It makes it much easier to brush his teeth. Although only one dog would let us use the toothbrush, the other enjoyed when we put it on our finger and rubbed his teeth. His tongue acted as if it was peanut butter! We have brushed our Westie's teeth every day since he was a pup. He is now 11 years old, and loves it. The Vet says that he has the most beautiful teeth she has ever seen, better than her's! He has only had his teeth cleaned twice his entire life, and then only because he was already asleep during surgery. My standard poodle likes this peanut toothpaste. He lets me uses the tooth brush and his teeth are really good. It also is great to his breath.